Another Place, originally uploaded by DragonDrop. The sun was an utterly luxurious commodity yesterday – the first proper T-Shirt day of the year – we were lucky enough to take full advantage by heading out early to the coast. Crosby is a funny place. Shameless on Sea. I felt quite overdressed in my jeans as the order of the day there seemed to be either Liverpool or Everton football strips (in pristine condition) OR branded tracksuit / shell suits. Who would have thought that is was harbouring one of the largest art installations in the world? 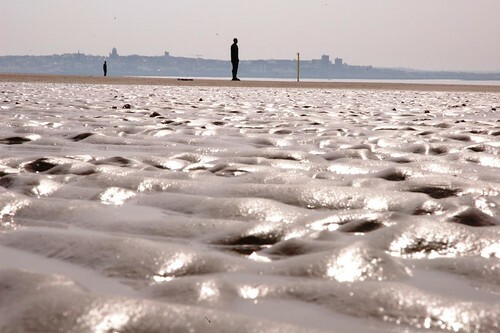 100 lifesize figures, cast in iron, spread out over a 3x1km stretch of beach. Each figure has its own bracelet with a unique number. Some are right next to the steps onto the beach, some are 1 km out. Depending on when you visit, you may see none at all, as the tide can completely submerge them all. Looking out through the haze I could see figures way out – tiny dots near the horizon yet others I could walk up to and touch. It was quite fascinating watching groups of people in isolation go to an individual figure and explore it. I found it reminiscent of the artists fantastic 90s piece entitled ‘Field of Dreams’ (which I was lucky enough to catch at Tate Liverpool, where Gormely displayed 40,000 mini figures with eyes all staring at the viewer). ‘Another Place’ again used repetition of form and invites an immersion into multiple perspective viewpoints. Its affirmed the notion that I really like the type of art that I can experience. I got a lot out of experiencing something in a space where I could have my own time with it, rather than jostling for space in a stuffy gallery. Bravo to Gormley. thought you should know, the earlier Gormley piece you refer to is actually called "Field for the British Isles" not "Field of Dreams". It's my favouritest thing ever. Field for the British Isles – that’s the one. I wonder what happened to them all. Did I hear they were touring?